The National Basketball League of Canada (NBL Canada; French: Ligue nationale de basketball du Canada) is a Canadian professional men's basketball league. The NBL was founded in 2011, when three teams formerly of the Premier Basketball League joined with four new franchises to form the NBL's "Original Seven". By 2017, the league had grown to ten teams, with six located in the Atlantic provinces and four in Ontario. The current champions are the London Lightning, having defeated the Halifax Hurricanes 4–3 in the 2018 NBL Finals. The league's season begins in November and ends in April of the following year. In mid-2011, discussion began of a domestic basketball minor league in Canada. Three franchises from the Premier Basketball League (PBL), the Halifax Rainmen, Quebec Kebs, and Saint John Mill Rats were the first to join the National Basketball League of Canada (NBL). The teams had been unhappy with the officiating in the PBL. On May 12 of that year in Halifax, Nova Scotia, league CEO Andre Levingston held a press conference regarding the creation of the NBL Canada. By the end of the summer, the London Lightning, Moncton Miracles, Oshawa Power, and Summerside Storm were established and had announced that they would join the league. There had also been unsuccessful attempts to start up teams in Fredericton, New Brunswick and Kingston, Ontario. 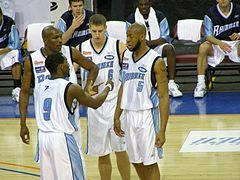 The Halifax Rainmen (pictured in 2008) chose to partake in the NBL Canada due to the poor quality of the PBL. In June 2011, the league finalized rules for its first season. There would be seven teams, four of which qualified for the playoffs, and no divisions. It would follow FIBA rules and each team would play 36 games in the regular season. Team rosters could contain 10–12 players, at least two of them Canadian, and they had a salary cap of $150,000 Canadian. Players could earn potentially $70,000 in one season, and each game would draw an average of 3,000 fans, varying by location. Levingston envisioned the NBL Canada as a more stable alternative to other North American minor basketball leagues with players living close to home while playing professionally. The NBL Canada held its first draft on August 21, 2011, at Rogers Centre. The Power selected Morgan Lewis of the University of Findlay with the first overall pick. Jerome Brown, who was picked fifth overall by the Mill Rats, was the first Canadian to be taken in the draft. The event was viewed by more than 6,000 people online from 93 different countries. 180 players from across the world attended the preceding NBL Canada combine. The first player to be signed into the NBL Canada was Canadian Yannick Anzuluni, who joined the Kebs on a three-year contract on August 17, 2011. On October 29, in the first game of the NBL Canada's inaugural 2011–12 NBL Canada season, the Kebs defeated the Miracles at the Colisée de Laval. Within a week, every team in the league had played at least one game. The NBL Canada's opening season brought in marquee players such as Gabe Freeman, Anthony Anderson, and Lawrence Wright. Amid the 2011 NBA lockout, six different players with past experience in the National Basketball Association (NBA), including Eddie Robinson and Rodney Buford, joined the NBL Canada. The London Lightning, coached by Micheal Ray Richardson, soon emerged as the top team in the league, going 28–8 by end of the regular season, which lasted until March 4, 2012. The team defeated the Halifax Rainmen, 3–2, in the best-of-five NBL Canada Finals series to claim the championship. They drew a league-high 5,106 fans to the John Labbatt Centre for the game. Following the NBL Canada's inaugural year, Canadian sports analyst Alex Walling claimed it was a success, commenting, "The NBL could hold its head up high. It has been a great season and they've gained a great deal of creditability. They've earned the kudos." Levingston touted the league because it "played a full schedule on every set date and never had a problem." Shortly after the season, in April, the NBL Canada held its first All-Star Game at Halifax Metro Centre. For its second season, the team salary cap remained at $150,000, with the possibility of an increase in the future. The NBL Canada also considered several cities in The Maritimes, Ontario, and Quebec, including Sydney, Nova Scotia. The league soon welcomed the Windsor Express after an ownership group from Windsor, Ontario and Detroit, led by Dartis Willis, Sr., began investing in the expansion team in June 2012. The team, which was approved into the league in late July, would play out of WFCU Centre. On the other hand, the Quebec Kebs, who had relocated to Laval, Quebec in the offseason, left the league after experiencing challenges in their first year. By November, the Kebs were replaced with the Montreal Jazz, who would compete at Centre Pierre Charbonneau. In the 2012–13 season, the league consisted of eight teams separated into divisions: four teams competed in the Atlantic Division, while the remaining four competed in the Central Division. Following the 2013–14, the league announced its first national broadcast deal with beIN Sports. Starting with the 2014–15 season, 2 regular season games will be aired each week with special coverage for playoffs and special events such as the All Star Weekend. The deal runs through the 2016–17 season. The 2014–15 NBL season ended in controversy as the Windsor Express were declared winners of the Championship series after the Halifax Rainmen failed to show for the seventh and deciding game. The Rainmen organization claimed that their players feared for their safety following a physical altercation earlier in the day with the Express, as the reason for not appearing in the game that night. Brampton A's – moved to Orangeville for 2015–16 season as the Orangeville A's. Orangeville A's – folded after the 2016–17 season. Halifax Rainmen – Filed for bankruptcy in July 2015 and new franchise called the Halifax Hurricanes were announced in September 2015. Oshawa Power – moved to Mississauga for 2013–14 as the Mississauga Power. Mississauga Power – Two years after relocating from Oshawa, Ontario, the Power folded to make way for the new NBA D-League franchise, the Raptors 905. Moncton Miracles – Ceased operations following the 2016–17 season and was replaced by a new franchise called the Moncton Magic. Montreal Jazz – Played the 2012–13 NBL Canada season, sat out the 2013–14 NBL Canada season and then folded. Niagara River Lions – Joined the Canadian Elite Basketball League for the 2019 season. Ottawa SkyHawks – Removed following the 2013–14 NBL Canada season after failing to repay a loan from the league. Quebec Kebs – The Quebec Kebs relocated to Laval, Quebec, after the initial 2011–12 NBL Canada season but folded before the start of the 2012–13 season. Saint John Mill Rats – Renamed as Saint John Riptide for 2016–17. Summerside Storm – Moved to Charlottetown for 2013–14 as the Island Storm. The London Lightning have the most championships with four wins, the Windsor Express are second with two wins. The Halifax Hurricanes appeared in the finals in each of their first three seasons, winning in their first appearance. The Halifax Rainmen and the Island Storm have appeared in two league finals failing to win the trophy. Statistics below are for all-time leaders at the end of the 2017–18 regular season only. The NBL Canada annually announces the winners of eight different awards. Players can be named Most Valuable Player, Canadian of the Year, Defensive Player of the Year, Rookie of the Year, Newcomer of the Year, Sixth Man of the Year. The league also awards the Coach of the Year and Executive of the Year. In addition, the top player in the NBL Canada Finals wins Finals Most Valuable Player. After the 2015–16 season, the league started announcing Commissioner's Awards to groups that helped support it, including ownership groups, teams, and referees. These awards were first handed out by Dave Magley. Until the 2013–14 season, the NBL Canada held All-Star Weekend every year. In the 2012 game, players Joey Haywood and Eddie Smith chose each team through a fantasy draft. The best performer in the game was named All-Star Game Most Valuable Player. Starting with the next All-Star game, the league began matching top players from the Central Division with those from the Atlantic Division. At least three Canadian players were required on each team. The NBL Canada discontinued the event after the 2014 game. ^ "NBL guarantees a team in Niagara Region". The London Free Press. 19 June 2018. ^ Grange, Michael (May 14, 2011). "A league of our own?". The Globe and Mail. Retrieved February 12, 2017. ^ "Rainmen, Mill Rats ditch Premier Basketball League". Global News. April 19, 2011. Retrieved February 12, 2017. ^ Sbiet, Tariq (August 22, 2011). "National Basketball League of Canada Comes To Life! Dreams Come True for Many Young Stars". NorthPoleHoops.com. Retrieved February 12, 2017. ^ "NBL: Does Moncton believe in Miracles?". Journal Pioneer. August 24, 2011. Retrieved February 12, 2017. ^ "Oshawa Power's the name, basketball's the game". DurhamRegion.com. August 19, 2011. Retrieved August 19, 2011. ^ Taber, Jane (November 2, 2012). "PEI's unlikely hotbed of pro basketball". The Globe and Mail. Retrieved February 12, 2017. ^ Dalla Costa, Morris (August 22, 2011). "New basketball era dawns". The London Free Press. Retrieved February 12, 2017. ^ Edmiston, Jake (June 4, 2011). "Talks become more serious". Kingston Whig-Standard. Retrieved February 12, 2017. ^ Drost, Philip. "Can Fredericton host an NBL team?". The Aquinian. Retrieved February 12, 2017. ^ Kirkpatrick, Harvey (July 5, 2011). "Kingston Bows out of NBL". Kingstonist. Retrieved February 12, 2017. ^ a b Wuest, Matthew (June 30, 2011). "NBL Canada finalizes league rules". Metro News. Retrieved February 13, 2017. ^ a b c d e f g "NBL Canada 2016-17 Preseason Guide" (PDF). NBL Canada. Retrieved February 12, 2017. ^ a b c Barrs, Rory (November 30, 2011). "Eddie Robinson hopes play with Halifax Rainmen leads him back to NBA". National Post. Retrieved February 13, 2017. ^ Kleps, Kevin (August 21, 2011). "Pro basketball: Harvey grad Morgan Lewis is drafted first overall in Canadian League". The News Herald. Retrieved February 12, 2017. ^ Smith, Doug (August 21, 2011). "Brown returns home as top Canadian in NBL draft". Toronto Star. Retrieved February 12, 2017. ^ "180 attend NBL combine in lead up to Sunday's draft". CBC. August 20, 2011. Retrieved February 12, 2017. ^ "Canadian Yannick Anzuluni First Player Signed Into NBL of Canada". SlanSportsManagement.com. August 17, 2011. Retrieved February 13, 2017. ^ "Moncton Miracles 97, Laval Kebs 102". RealGM. Retrieved February 12, 2017. ^ Gay, Carlan. "First Ever NBL Power Rankings Released!". NorthPoleHoops.com. Retrieved February 12, 2017. ^ a b Cochrane, Chris (March 26, 2012). "Lightning deserving NBL champions". The Chronicle Herald. Retrieved February 13, 2017. ^ a b Walling, Alex (March 26, 2012). "Walling: National Basketball League A Success In First Year". TSN. Retrieved February 13, 2017. ^ Sager, Neate (March 27, 2012). "National Basketball League of Canada's lack of stumbles make Year 1 a success". Yahoo! Sports. Retrieved February 15, 2017. ^ "Pro basketball can work in Windsor, say some insiders". CBC. June 29, 2012. Retrieved February 15, 2017. ^ a b Schmidt, Doug (July 25, 2012). "Pro hoops coming to Windsor". Windsor Star. Retrieved February 15, 2017. ^ Schmidt, Doug (July 30, 2012). "Is it a train? No, it's Windsor's pro basketball team". Windsor Star. Retrieved February 15, 2017. ^ Freeman, Brian (October 27, 2012). "NBL heading to Montreal". The Chronicle Herald. Retrieved February 15, 2017. ^ "Montreal gets a new basketball team". CTV News. November 1, 2012. Retrieved February 15, 2017. ^ "NBL Canada - A Truly Canadian League". NBL Canada. June 17, 2013. Retrieved February 16, 2017. ^ Dalla Costa, Morris (August 5, 2013). "Montreal Jazz decision sends message of failure". The London Free Press. Retrieved February 16, 2017. ^ "NBL Canada lands historic deal". NBLCanada.ca. 2014-04-23. Retrieved 2014-04-23. ^ nurun.com. "Welcome to The Five". Sudbury Star. Retrieved 2018-05-24. ^ "Sudbury Expansion team to start fall of 2018". NBLC. 1 August 2017. ^ "Halifax Rainmen file for bankruptcy". Global News. 2015-07-06. ^ "Professional basketball returning to Halifax for 2015-16 NBLC season with local ownership" (PDF). Halifax Hurricanes. 2015-09-03. ^ "Magic retires Miracles: Moncton welcomes new pro basketball team". cbc.ca. Retrieved 2017-06-23. ^ "NBL Canada Announces Postseason Awards For The 2015-2016 Season". NBL Canada. May 6, 2016. Retrieved February 12, 2017. ^ "Hurricanes Win NBL Canada Championship". OurSportsCentral.com. Retrieved February 12, 2017. ^ "NBL Canada Announces First Annual Commissioner's Awards". NBL Canada. May 16, 2016. Retrieved February 13, 2017. ^ "Haywood, Smith NBL all-star team captains". The Chronicle Herald. March 1, 2012. Retrieved February 12, 2017. ^ "Halifax Rainmen Sign NBL Canada's Top Scorer and All Star MVP". OurSportsCentral.com. September 17, 2012. Retrieved February 12, 2017. ^ Bennett, Anthony (April 2, 2013). "2013 NBL Canada All Stars Named". NBL Canada. Retrieved February 12, 2017. ^ "NBL All-Star team rosters announced". OurWindsor. April 7, 2014. Retrieved February 12, 2017.